These are the show notes to an audio episode. You can listen online right here by clicking: http://media.libsyn.com/media/airspeed/AirspeedSpatial.mp3. 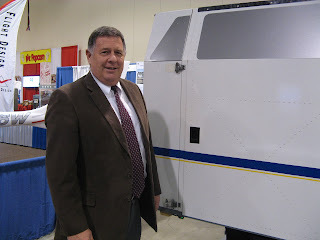 I spent some time recently at the Great Lakes Aviation Conference and Expo in Novi, Michigan. While there, I took advantage of the opportunity to go through the Spatial Disorientation Simulator made available by the FAA’s Civil Aerospace Medical Institute. It’s a box that contains a single seat with a video screen and flight controls in front of it. You sit in the box in the dark and you fly some basic maneuvers like a climb and some turns. You have a horizon for the first bit of the climb and then you ascend into the clouds. While you’re concentrating on flying, the box you’re sitting in rotates around its vertical axis something like seven to 12 times per minute. It’ll also pitch forward and back a little. The simulator lets you experience two vestibular/somatogyral illusions: The coriolis illusion and the illusion that can put you in the so-called graveyard spiral. The coriolis illusion occurs when you stimulate the semicircular canals by suddenly tilting your head while the aircraft is turning. 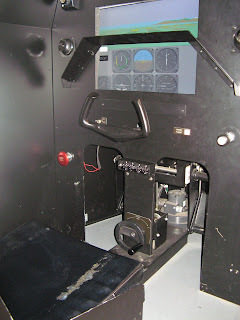 The simulator rotates slowly for several minutes while you’re flying a simulator. You get used to the rotation and you begin to accept the sensations from your semicircular canals as telling you that you’re flying straight and level. When you move your head forward or back after this, you get the sense that the aircraft is moving in all three axes. I got the sense when I moved my head forward that the aircraft was snapping down and to the right. And the opposite when I moved my head back. The graveyard spiral happens when you return to level flight after a prolonged bank turn. When you enter the turn, you feel the sensation of a turn in the same direction. If the turn continues for an extended period of time, you lose the turning sensation. Your body has settled into a stabilized mode that’s more or less just like level flight. Then you level the wings. That produces a sensation that the airplane is turning and banking in the opposite direction. If you believe the illusion of the turn (and it’s very compelling), you’ll re-enter the original turn in an attempt to counteract the sensation of the opposite turn. If you re-enter the turn, you’ll continue in that turn and you’ll start losing altitude. If you pull to get the altitude back or apply power, you’ll only make the turn tighter. If you don’t recognize the illusion and level the wings, you’ll continue the left turn and keep losing altitude until you augur in. The smooth rotation of the box lets your vestibular system get used to that rotation so that leaning forward and back gives you the coriolis illusion. It can also change rotation to give you that really, really convincing feeling that might lead to a graveyard spiral. Today’s episode comes in two phases. First, I take the MP3 recorder into the box and fly the simulation. The simulation takes something like nine minutes, most of which is pretty quiet and consists of my flying a climbing turn. I’m going to accelerate the process by fading the audio up and down to tell you where I’ve omitted audio. You’ll hear the simulator giving me vectors and other instructions and, after each of the effects, the initial explanation of the effect that I just felt. You’ll also hear me give a “whoah” at appropriate times. I had intended to give a little more commentary, but I found that the illusions were so compelling that I was processing them myself and couldn’t really talk much about them. I guess that’s what the commentary on the show is for. At the FAA staff’s suggestion, I exaggerated my head movements to really experience the effect. Note that I didn’t have to move my head much at all to get a really wild sensation in the graveyard spiral demonstration. So here’s the simulator ride. Afterward, I talked to Rogers Shaw, the team leader of the Airman Educational Personnel. Here’s the interview. The take-home for this episode is that the things that the textbook tells you about physiological illusions are real. They’re very real. Even though I knew for a fact that I was in a box in an exhibit hall in Novi, Michigan, the sense of opposite rotation was overwhelming. If you’re going to fly on instruments or without a good horizon, you need to know that these illusions can happen and that they can happen to you. I’m glad that I experienced them for the first time in a simulator in Novi and not in an aircraft. If you have the opportunity, go through this simulation. But even if you don’t, know and understand that your noggin is much more likely than your instruments to lead you astray. Flying in the clouds takes discipline in a number of different respects. Probably the most important is the discipline to get on your gages and believe them, even when everything you’re used to from walking around on the ground is screaming that things are wildly amiss. Instrument flight is transcendental in many different ways. My personal favorite is breaking out of a cloud layer in a climb and then dragging my wheels in the cloud tops. But the price for that is building the ability to transcend what your senses have told you all your life and to rely on the science and instrumentation in front of you. 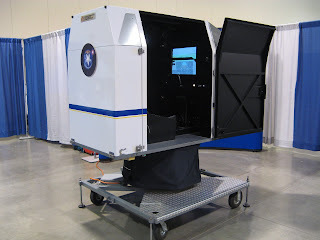 Thanks to the FAA’s Civil Aerospace Medical Institute for bringing the simulator to Novi. Make sure to watch for it at a conference or other event near you.